The light shines into the act of life for only the briefest moment-perhaps only a matter of seconds. Once it is gone and one has failed to grasp its offered revelation, there is no second chance. One may have to live the rest of one’s life in hopeless depths of loneliness and remorse. In that twilight world, one can no longer look forward to anything. All that such a person holds in his hands is the withered corpse of what should have been. As much as I love this book, I can’t help but disagree with this passage, even if it is a poignant reminder of fleeting moments and squandered opportunities. I think the light that shines into our lives is limited only by our notions of what is possible. Yesterday, a gentleman shared the story of a woman who was diagnosed with a tumor of the spine which was going to render her paralysed from the waist down. What may have left most people shattered made this woman react with enough strength to face her reality head-on. Doctors had informed her of the gradual onset of paralysis and she spent the intervening time preparing for her life ahead in practical terms. After a few years her young daughter was also diagnosed as having the same condition. And they found a way to lead fulfilled lives on their terms. There are countless stories of people not being limited by their circumstances. And yet, more often than not happiness is equated with requiring a certain set of attributes that fit into earmarked boxes. These include models of success, physical beauty, mental acumen, all defined by the external world. If only we could save ourselves a whole lot of heartburn and be reminded each day of one simple fact: Happiness is simply a celebration of the limitless light we hold inside. Easier said than done, but worth fighting with ourselves for, no? Wow! So well written and deep. I had to read it 3 to 4 times for my own delight and each time it made a strong point to my head and heart. Really, you got some great talent in you! 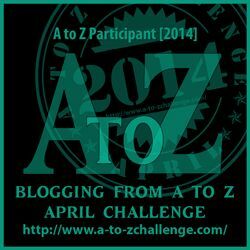 Good luck with the atozchallenge! It has helped me come across so many like minded personalities and blogs.